Your mind races to process the totality of circumstances as you approach a potentially dangerous subject. You’re not sure if this large and seemingly aggressive individual is armed, an experienced fighter or will comply with verbal commands. As your commands are dismissed, you escalate to OC deployment. Suddenly, the subject extends his hands out from his face and ducks while approaching you quickly. Seconds count and your safety is on the line. Are you forced to escalate or do you have an OC countermeasure? Static subjects are few and far between. Aggressive and non-compliant behavior often results in subject countermeasures to avoid officer control and restraint. When force escalation triggers the use of OC, subjects will frequently move, duck or attempt to block the spray. As these dynamic encounters ensue, the officer’s task of gaining control becomes increasingly difficult. 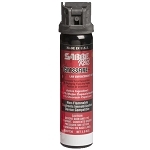 SABRE’s Crossfire technology was specifically developed to give officers the upper-hand when controlling dynamic subjects. Superior to 1st and 2nd generation Aerosol Irritant Projectors, Crossfire introduces 3rd generation technology which allows SABRE OC canisters to deploy continuously from any position. Picture the face of an analog clock which displays the time through the use of fixed numbered dials and moving hands. 1st generation OC sprays only deploy upright between the clock’s 10 and 2 dials. 2nd generation OC sprays increase target acquisition with the addition of ½ second bursts deployments between the clock’s 4 and 8 dials. The 3rd generation Crossfire will deploy continuously from any position or dial on a clock to maximize target acquisition when encountering dynamic subjects. 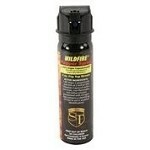 Crossfire Technology is currently available with SABRE DEFENSE, SABRE 5.0, and SABRE Red formulations. •Crossfire will deploy vertically downward, from a horizontal position, if needed. •Crossfire will deploy vertically upward, from a horizontal position, if needed. 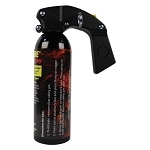 •Inert training units featuring Crossfire Technology are also available. Officers can now increase their safety and reduce control and restraint challenges with Crossfire which permits continuous OC deployment from any position.